This is a fix-only build for the rendering issues people were having using fullscreen and funny resolutions in 1711/1712. Please post on the forums if you have any more issues with strange rendering, with as much detail as you can to help us reproduce your issue. Logs, hardware, operating system and settings used would be a good start. There is one known caveat to this – Windows High DPI rendering mode can cause the game to be cut off in fullscreen mode. 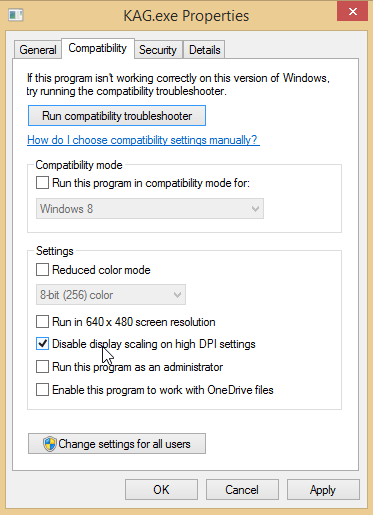 The only fix at the moment is to instruct windows not to apply DPI scaling to KAG by right-clicking KAG.exe in your KAG directory, selecting properties, and disabling scaling in the compatibility tab, like in the screenshot below. We’re looking into possible fixes from our side, but our build infrastructure and other compatibility concerns mean this will take a little more time than an afternoon.